Presentation of Subchondral Cyst Causing Bone Defect Around Knee and its Management During TKR. Orthopaedic Arthroscopy Knee & Shoulder Clinic, 1 Court House, Opp St Xaviers School, Dhobhi Talao, Mumbai 400002. India. Introduction: We report an osteoarthritic patient with huge subchondral cyst-like lesions in the Anterior part of distal femur. Deep and large bone defects and severe lateral laxity due to Advanced osteoarthritis was successfully treated with semi-constrained type total knee arthroplasty with long stem. 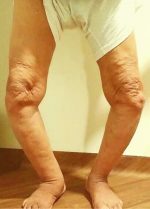 Case Report: A 70yrs old Female was admitted in our institution diagnosed with severe bilateral Osteoarthritis. The x-rays showed bone on bone Tricompartment OA Knee with Varus Malalignment. She was posted for Single Stage Bilateral Total Knee Replacement and as planned the Left Knee Was Operated first. After exposure, Proximal Tibial, Distal Femoral Cuts and measurement of extension gaps the synovium from the anterior Femur was removed and sizing was done. The AP cut was then proceeded with. We spotted a small Osteochondral Cyst in the Anterior Femur which was curretted to remove the cystic material, which is when we realised that the cyst was large and communicating with the medulary canal. The remaining Femoral preparation was done keeping in mind the risk of iatrogenic fracture and extension Stem was used in the femur. The defect was then packed cancellous bone graft. Conclusion: If suspected a Preoperative MRI should be done to exclude any subchondral cysts osteochondral defects and any surprise during surgery. Usually one should keep extension stems ready for difficult cases. Operating surgeon should know his implants very well, as in many standard implants extension stems can only be used when distal femur cuts are taken accordingly as 50 Valgus. Mini incision should be avoided because it may fail to reveal such surprises and may land into periprosthetic fractures. Keywords: Sub-chondral Cyst, Total Knee Replacement, Extension Stems, Osteoarthritis. Osteoarthritis of the knee presents as destruction and degeneration of articular cartilage that results in pathological changes to the subchondral bone . Although the pathogenesis of bone changes is poorly understood, it appears to be influenced by alterations in abnormal mechanical forces around the affected joint. In addition to the degeneration of cartilage, characteristic radiological findings include narrowing of the joint space, subchondral sclerosis, and the appearance of osteophytes; intra-articular osteochondral bodies and subchondral cysts are all associated with OA. Among these findings, subchondral cyst formation is often found mainly in OA and rheumatoid arthritis (RA)patients. Whereas RA is reported to cause huge synovialcysts [2–6], well known as geodes , huge subchondralcysts associated with OA are extremely rare. We report an osteoarthritic patient with huge subchondral cyst-like lesions in the Anterior part of distal femur. Deep and large bone defects and severe lateral laxity due to Advanced osteoarthritis was successfully treated with semi-constrained type total knee arthroplasty with long stem. A 70 year old female with bilateral knee pain presented to our hospital. After clinical examination and various investigation she was diagnosed as Osteoarthritis of both knee. Upon visiting our institution, she complained of severe bilateral knee pain that had gradually worsened until she could no longer walk at any speed because of pain. On physical examination of the bilateral knees, the patient had a severely restricted range of motion with medial joint line tenderness, pain at extension and high flexion, and starting pain. There was slight swelling but no palpable joint effusion, redness, or local heat. The patient’s gait was slow, she used a walking stick, and exhibited a lateral thrust. Manual stress tests indicated severe laterallaxity with no anteroposterior instability. Neurovascular examination returned normal findings. Patient was a known hypertensive patient and all the other investigations were within normal limits. Plain radiographs showed severe advanced osteoarthritis of both the knee with severe varus deformity and lateral thurst during walking [Fig 1]. Patient was posted for Bilateral knee replacement in single setting and left knee was planned to be done first. Proper Distal femoral cut was taken and from Anterior femur synovium was removed and anterior cut was taken. A small cystic defect was found which was curetted and cleaned [Fig 2]. 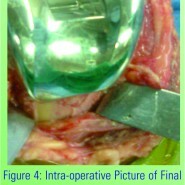 After curettage ,a large defect was found on anterior femur which was communicating with the femoral canal [Fig 3]. After proper preparation of femoral canal, semi constrained polyethylene insert with long stem implant was used and the subchondral cyst was curetted well and bone grafted leading to complete relief of patients symptoms. Multiple huge subchondral cysts are often found in RA patients, and these were first reported as geodes by Jayson et al. . Shih et al. reported a huge tibial subchondralcyst successfully treated with standard stem and autologous bone grafting. However, there have been no reported cases of multiple huge subchondral cysts in osteoarthritic patients to our knowledge. In the present osteoarthritic patient, severe bone defects and lateral laxity due to huge cystic lesions compelled us to use a semi-constrainedtype prosthesis with a long stem. The treatment provided the patient with relief of pain and stable daily life. However, the follow-up period is as short; thus, a longer term follow-up is needed to investigate the real clinical usefulness of the treatment. Generally, there are two main theories that attempt to explain the development of osteoarthritic cysts. The first is based on the idea that synovial fluid intrudes through the articular cartilage, resulting in hydraulic destruction of subchondral bone . This theory is supported by the presence of defects in the articular cartilage resulting from cysts, of fragments of articular cartilage within cysts, and the similarity of cyst fluid to synovial fluid . 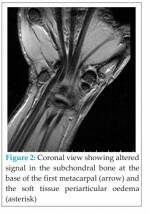 The second theory suggests that a localized area of subchondral necrosis of bone results from repetitive micro trauma, which leads to cystic degeneration in the bone while the articular cartilage is left intact [11, 12]. This is based on evidence of bony contusion, trabecular fracture, and primary subchondralosteolysis, which may subsequently communicate with the joint if the over lying articular cartilage and subchondral bone plate crack . In our case, the existence of defects in the articular cartilage above the cysts partly indicates the validity of the first theory. However, as shown in the MRI finding in the lower panel of Fig. 3 and the histological finding in the upper panel of Fig. 5, it is of note that the cysticlesion seems to fuse into a lipoma-like lesion. Spjut et al  reported a coalescence of smaller degenerative cystsas a mechanism for huge cyst formation. 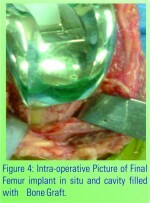 In addition, Wada and Lambert  reported the deposition of intraosseous fat in a degenerating simple bone cyst, indicating that the intraosseous cavity is partly filled with fat after involution of the cyst. Taken together, these previous reports and our findings suggest one degenerative subchondral cyst may fuse with another old intraosseous cavity filled with fat tissue. Accordingly, the coalescence of two different cysts at different stages may result in huge cyst formation. In the present case, the patient was initially diagnosed with pseudogout based on the findings of severe pain and CPPD crystal deposits. In addition, histological findings [Fig. 5, lower panel] showed no evidence of RA or its related diseases. Cysts associated with CPPD are similar to those of degenerative joint disease in that they are commonly associated with joint space loss, eburnation, and asclerotic rim. They may be numerous and larger than those associated with degenerative joint disease with fragmentation and collapse of the subchondral bone . In the present case, the existence of pseudogout may have accelerated the degenerative change and huge cyst formation. In conclusion, we reported a rare case of multiple huge subchondral cysts successfully treated with surgery. Deep and large bone defects and severe lateral laxity due to multiple huge subchondral cystic lesions were treated with semi-constrained type total knee arthroplasty with a long stem and augmentation, providing pain relief and patient satisfaction at 1 and 2yr Follow up. If suspected a Preoperative MRI should be done to exclude any subchondral cysts, osteochondral defects and any surprise during surgery. Usually one should keep extension stems ready for difficult cases. Operating surgeon should know his implants very well, as in many standard implants extension stems can only be used when distal femur cuts are taken accordingly as 50 Valgus. Mini incision should be avoided because it may fail to reveal such surprises and may land into periprosthetic fractures. 1. Oettmeier R, Abendroth K. Osteoarthritis and bone: osteologictypes of osteoarthritis of the hip. Skelet Radiol. 1989;18:165–74. 2. 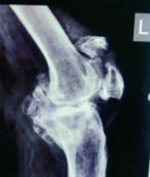 Lohse A, Carbillet JP, Onimus M, Stevenel F, Toussirot E,Wendling D. Giant intraosseous cyst-like lesions in rheumatoidarthritis report of a case. Joint Bone Spine. 2003;70:67–70. 3. Maher MM, Kennedy J, Hynes D, Murray JG, O’Connell D.Giant distal humeral geode. Skelet Radiol. 2000;29:156–67. 4. Sabri F, Calmes D, Muller MJ. Large articular geode cyst inrheumatoid polyarthritis. Acta Orthop Belg. 1989;55:242–7. 5. Hirose T, Kurosawa H, Sakuraba K, Nosawa M, Matsuda K Giant geode as a differential diagnosis of a large lobular radiolucencyin the distal femur of a patient with rheumatoid arthritis. 6. Maricic MJ, Pitt MJ, Graham AR, Speer DP. Giant cyst-likelesions in rheumatoid arthritis. J Rheumatol. 1990;17:552–5. 7. Jayson MI, Rubenstein D, Dixon AS. Intra-articular pressure andrheumatoid geodes (bone ‘cysts’). Ann Rheum Dis. 1970;29(5):496–502. 8. Shih HN, Hsu KY, Tan CF, Hsueh S, Hsu RW. Total kneearthroplasty in a rheumatoid arthritic knee with large geode: acase report. Changgeng Yi Xue Za Zhi. 1997;20(3):241–5. 9. Schmalzried TP, Akizuki KH, Fedenko AN, Mirra J. The role ofaccess of joint fluid to bone in periarticular osteolysis. J BoneJoint Surg A [Am]. 1997;79:447–52. 10. Landells JW. The bone cysts of osteoarthritis. J Bone Joint SurgB [Br]. 1953;35:643–9. 11. Rhaney K, Lamb DW. The cysts of osteoarthritis of the hip: aradiological and pathological study. J Bone Joint Surg B [Br]. 1955;37:663–75. 12. Ferguson AB. The pathological changes in degenerative arthritisof the hip and treatment by rotational osteotomy. J Bone JointSurg A [Am]. 1964;46:1337–52. 13. Last RJ. Anatomy, regional and applied. 6th ed. Edinburgh:Churchill Livingstone; 1978. 14. Spjut HJ, Dorfman HD, Fechner RE, Ackerman LV. Tumors ofbone and cartilage. Atlas of tumor pathology, 2nd series, fasc. 5.Washington, DC: Armed Forces Institute of Pathology; 1971. 15. Wada R, Lambert RGW. Deposition of intraosseous fat in adegenerating simple bone cyst. Skelet Radiol. 2005;34:415–8. 16. Donahue F, Turkel DH, Mnaymneh W, Mnaymneh LG. Intraosseousganglion cyst associated with neuropathy. SkeletRadiol.1996;25:675–8. 17 .Masaya Minoda Tomoyuki Matsumoto Seiji Kubo Takehiko Matsushita Koji Takayama Yukiko Morinaga Masahiro Kurosaka Ryosuke Kuroda,Multiple huge subchondral cysts associated with pseudogoutin the bilateral knees:J Orthop,2012,17:817 – 821.